Why has a whole field of technology of better loudspeaker performance been left practically unexplored? Not any more. Why have the basic laws of electrodynamics been disregarded in the design of loudspeaker operations? A frank exposure of the flaws of voltage drive and a thorough, groundbreaking guide to the physically reasonable way of operating electrodynamic loudspeakers - current-drive. The author argues that the sound quality of virtually all existing speaker systems has been severely impaired by the manifoldly indefinite electromotive forces induced in the voice coil (arising from both motion and inductance), that corrupt the flow of current; and what's dramatic - the measurable evidence is plain and overwhelming. These inherent EMFs in themselves can never be suppressed by any kind of amplifier, but their detrimental effect on current and hence on sonic performance can be eliminated by adequate source impedance. Thus, the secret of valve amplifiers also becomes apparent. Written for all from the academic community to lay hobbyists. Besides new concepts for amplifier and speaker design and demonstrative projects, the book also features novel ideas for modelling, filter design, measurements, and protection; and an enlightening tutorial on analogue linear systems. Is it indeed possible that the audio power amplifiers of the world operate - and have operated since their inception - on a wrong principle? Is it also possible that the sonic aberration caused by this gross technical mistake has substantially impaired our experience with loudspeaker-produced sound, with implications even on the musical evolution of our civilization? According to laws of physics, electric current is that which in a speaker driver effects diaphragm acceleration, which in turn produces sound pressure. Yet all power amplifiers strive, often tooth and nail, to control the voltage at the loudspeaker terminals, which only indirectly affects the current flowing in the voice coil. Current-controlling loudspeakers is nevertheless not an all-new concept. Some of the benefits it brings, like decreasing of harmonic distortion and expanding of frequency range, have been known at least by specialists. However, there prevails great ignorance about the many grave interference mechanisms that traditional voltage drive inevitably creates and that are fully or partially eliminable by correctly operating current-drive. Also, current-drive does not necessitate active speakers any more than voltage drive does, but amazing improvement in sound quality is achievable by simple means. Based on properties of linear systems and investigation, many other flawed conceptions prevalent in the field of audio technology are also pointed out. When writing this, virtually no all-frequency audio equipment operating on the current-principle has yet been seen on the market. One reason may be that controlling the resonance of the bass driver under current-drive has been considered difficult. For this, new practical techniques and circuits are introduced, so that technical obstacles for extensive utilization of the principle are cleared away. Also, it is shown that so-called electrical damping, that pertains to voltage drive, is in reality nonexistent outside the fundamental resonance region. 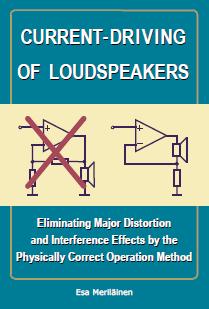 The book has been written out with easy-to-understand language for both professionals and interested laymen, thus making the new approach amplifier and loudspeaker realization concepts available to all. An ordinary circuit simulator can also be used for predicting the acoustic response, without need for special software. In the appendices is provided valuable knowledge about analogue systems. If sound quality matters are of any interest to you or your company, do not leave yourself without this very essential information you are not getting from elsewhere!